Fun doggy shots for the day! They surely do look like they're having fun!! Hope you have a wonderful weekend lady!! Your dogs, their shadows AND their reflections are all incredibly busy and much more agile than I could possibly be. Have a lovely weekend. beautiful reflections and shadows. You sure do cover a lot of territory making for some lovely shots. 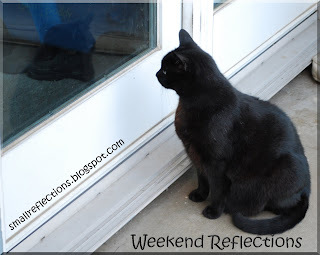 A lovely cat reflection and I also liked a lot your collage, well done! Lots of fun for your sweet pets! Very nice reflections here.I like your mosaics! I love to see dogs running free on a beach (where appropriate of course). Great pictures. HRG: They look like they are having a ball at the beach. THis is a gorgeous reflection mosaic. The dogs are having a ball and they are lovely to look at. Nice collection of small reflections. A collage can be more powerful than a single image. I like these. Thanks for stopping by The Aware Writer. Amazing photos of the dogs! They looks like they're having a wonderful time :o) Thanks for visiting my blog! 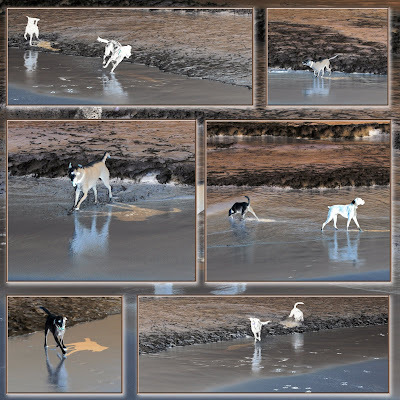 Your dogs have very clear reflections for all the running around they were doing! Well done. Looks like everyone had fun at the beach! Great action photos of the dogs. They all seem to be having a great time playing in the water. Can Daisy come over and play? 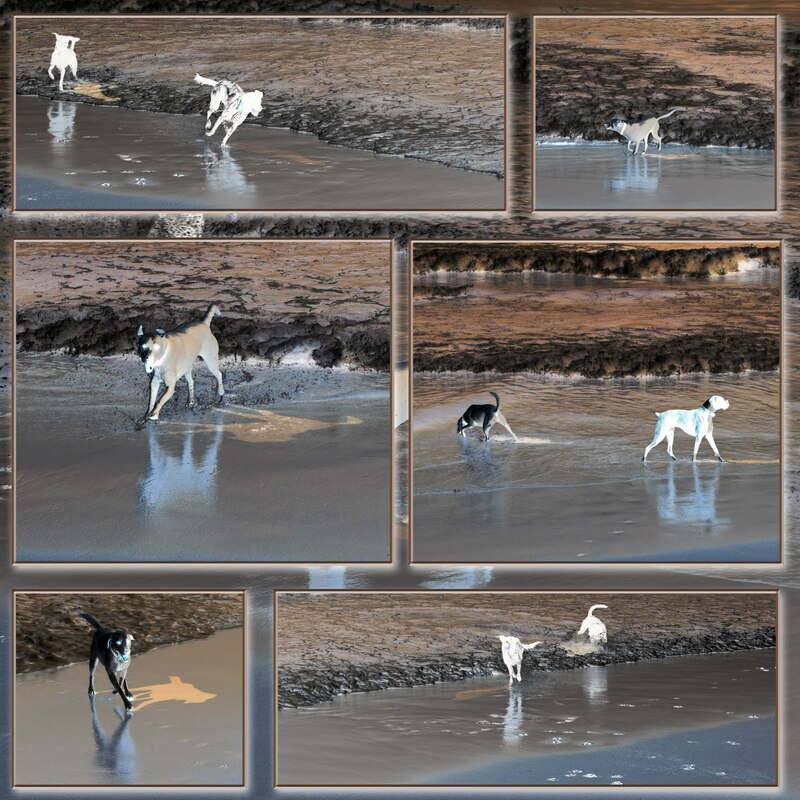 I love to see beach reflections, these are terrific and the dogs are beautiful. 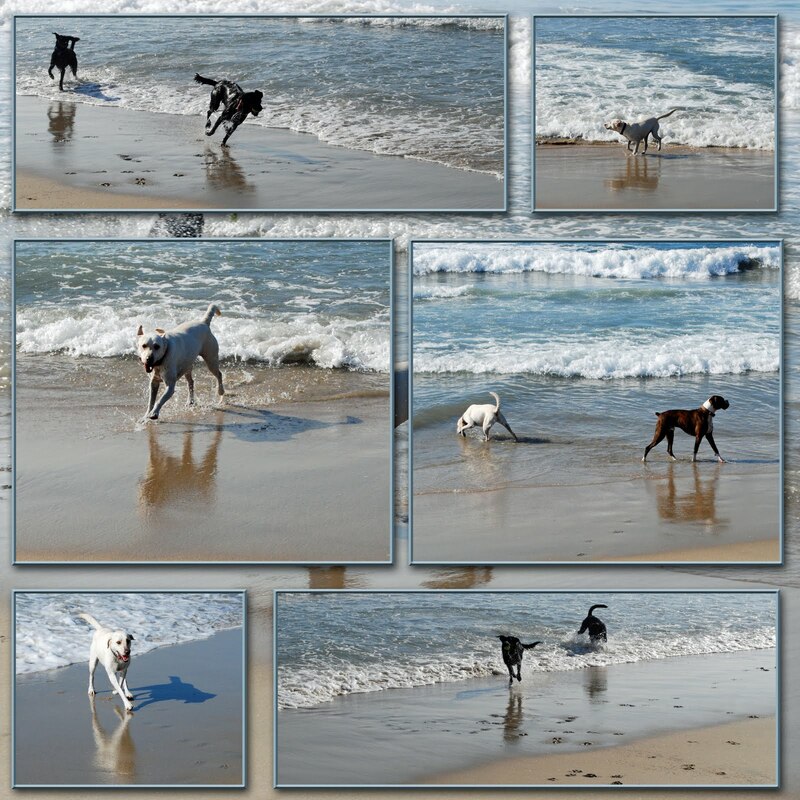 It's good to see the dogs having fun at the beach. You did a great job with the reflections and shadows. 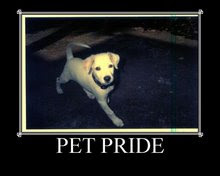 It seems our pets enjoy "vacations" as much as we do and I'm sure they see a trip to the beach as a mini-vacation. :) Fun times! Your animals look so happy. I don't care what anyone says - the smile, yes, they do, when they are happy and with someone they love. Just stopping by with my Sunday wishes! I count meeting you in blogland as one of my newest and best blessings! Nice catch! Mine is up. Hope you can drop by to view my very first entry. Your visit is a blessing. God Bless! Beautiful dog mosaic. They do look like they are having fun on the beach. I love those joyful reflections in the dog mosaic! Funny that we would never see cats playing like that at the beach. You had great fun with these - thanks for sharing dogs, day, photos, & fun! Great shots! Looks like they are all having a blast at the beach! I like the cat looking at herself. My friend has a dog and a cat. The dog is not allowed inside the house, the cat is. Often they looked at each other through the glass door. I told my friend that she unfair. Lucky dogs! I love the little black cat! Ooh how fun is that! 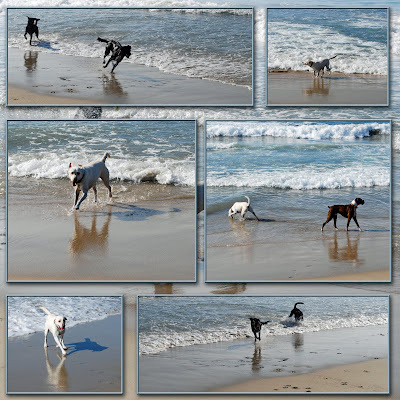 Love these beach pictures - great collages!